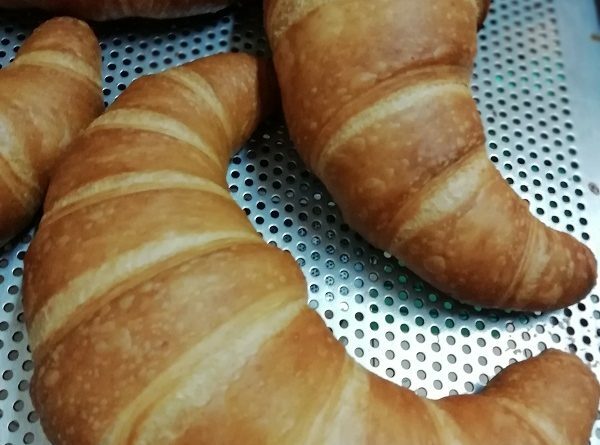 Croissant are definitely one of those foods that takes time…but oh so worthy! Fresh gluten free croissants made at home perfect for tea party. In a large bowl, place the flour, yeast and Splenda, and whisk to combine well. Add the salt, and whisk again to combine. Create a well in the center of the dry ingredients, add the butter and milk. Add more flour by the half-teaspoonful if necessary to bring the dough together. Sprinkle the top very lightly with more flour, and roll into a 9-inch round. Wrap tightly in plastic wrap and place in the refrigerator to chill while you prepare the butter packet. Sprinkle a piece of unbleached parchment paper with 1/8 cup of the flour, and place all 16 tablespoons of butter on top and press together. Sprinkle with the remaining 2 tablespoons of flour, and cover with another piece of unbleached parchment paper. Pound the butter with a rolling pin until it flattens and melds together. Uncover and fold the flattened butter in half, cover again with the parchment and pound again until you have a 5-inch square butter packet. Cover the butter packet completely with parchment. Remove the 9-inch round dough from the refrigerator, unwrap. Flour the surface and place the dough on it. Place the chilled butter packet directly in the center of the dough and score the sides of the dough lightly to represent the exact size of the butter. Remove the butter and set it aside. 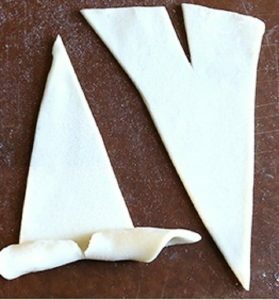 Using a rolling pin, begin at the site of each of the four scorings and roll the edges of the dough away from the center to create 4 flaps, leaving the center of the dough intact. Return the butter packet to the intact center of the dough, and wrap the flaps of the dough around the butter packet like you would a present. Once the dough has finished chilling after its first turn, repeat the process of rolling the 3-layer dough out into a 1/2-inch thick rectangle. 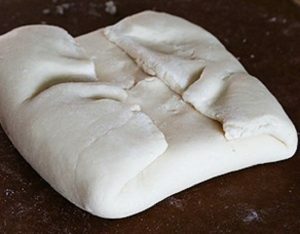 Make the dough like a business letter, at least 4 more times, wrapping and chilling the 3-layer rectangle of dough in the refrigerator for at least 30 minutes in between turns. Line baking sheets with parchment paper and set them aside. Roll out the prepared 3-layer croissant dough into a 1/4-inch thick rectangle. Using a very sharp knife, square the edges, then cut out as many 4-inch x 6-inch rectangles as you can. Slice each rectangle diagonally into two triangles and separate the shapes from one another. Roll each triangle out to elongate it to about 8-inches from base to tip. Slice a notch into the base of each triangle about 1/2-inch deep, and roll each triangle into a coil from base to tip, turning the edges slightly away from each other as you roll. Place on the prepared baking sheets, seam side down, about 2-inches apart from one another. Cover lightly with oiled plastic wrap and place in a warm, draft-free location until nearly doubled in size. Uncover the baking sheets and brush the tops and sides of the croissants with the egg wash.
Place the shaped and proofed croissants in the refrigerator to chill for at least 10 minutes or until mostly firm. While the shaped croissants are chilling, preheat your oven to 400 F.
Place the croissants in the center of the preheated oven, one baking sheet at a time, and bake for about 15 minutes, or until deep golden brown all over and firm to the touch. Allow to cool briefly before serving.